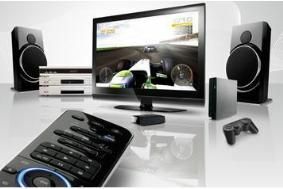 One For All launches universal remote for PlayStation 3 | What Hi-Fi? The remote, which can control up to six devices and has a range of 10 metres, will come bundled with the adapter and sell for £50. The PS3 code will be pre-programmed into the SmartControl remote, which then pairs with the PS3 adapter, allowing for programmable control of PS3 commands, including remote control of Play TV. The firmware is fully upgradeable online, ensuring you can keep the remote up-to-speed with any future PlayStation 3 updates. The adapter is battery powered, using two AA batteries, and can also be connected via USB to the PS3. The SmartControl remote is due out in December for £50 and will be on sale from Amazon, Play and others.